Our favourite hotel, and arguably the best in Barcelona, is the Mandarin Oriental along the main thoroughfare of the city, Passeig de Gracia. 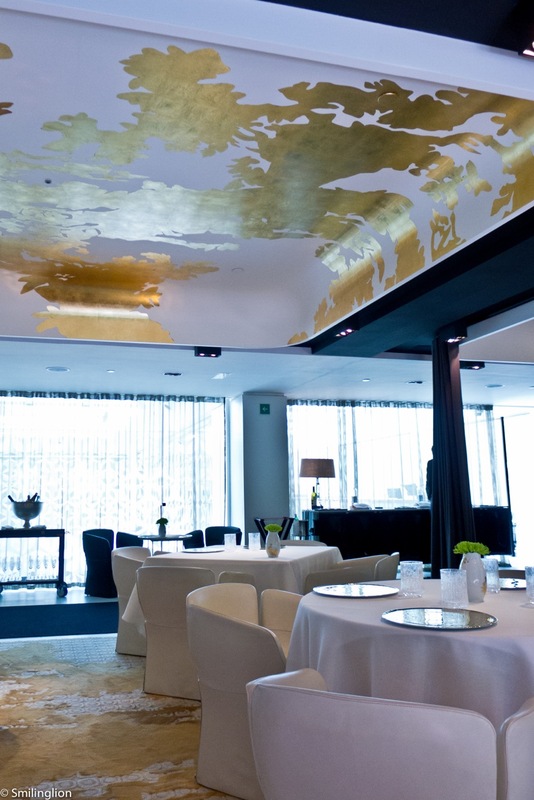 It is also the home of Moments, restaurant helmed by Raul Balam, the son of the famous Catalan chef Carme Ruscalleda. Our meal at Chef Carme's 3 Michelin star restaurant outside Barcelona, Sant Pau, last autumn was one of our best meals of 2012, and with the recent rise of their city centre venture (culminating in it receiving its second star for the 2013 Guide), we were looking forward to seeing if it could match up with the accomplished Sant Pau. The dining room was actually quite small and intimate, with some outdoor tables in the corridor along the side of the restaurant (which could be nice during the cooler months). The kitchen was exposed on both sides with large glass windows separating the kitchen from the dining room on one side and the boundary wall (covered with vines and creepers) on the other. They had an a la carte menu as well as a tasting menu. We chose the tasting menu. 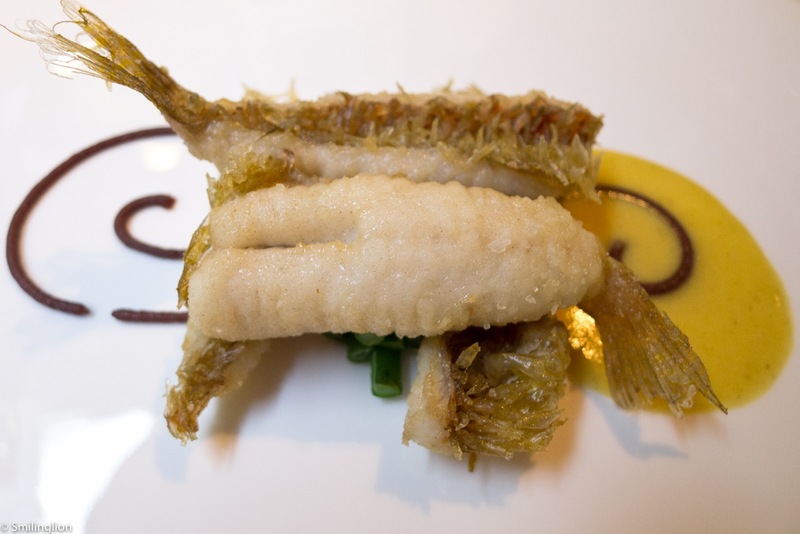 There were many small touches which we felt were very thoughtful and reminded us of our meal at Sant Pau. For example, we were given a small but artistic menu card naming each and every amuse bouche, which was quite rare and very informational. 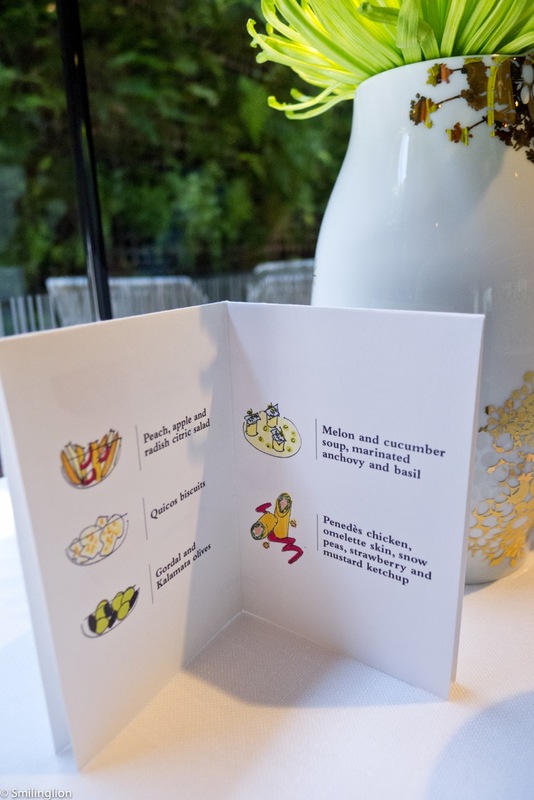 In addition, they printed out a card which set out the tasting menu customised with our names. We are suckers for this level of attention given to us in a restaurant. Peach, apple and radish citric salad, Quicos biscuits, Gordal and Kalamata olives: If they wanted to get our attention and shock our senses, these would have done it. 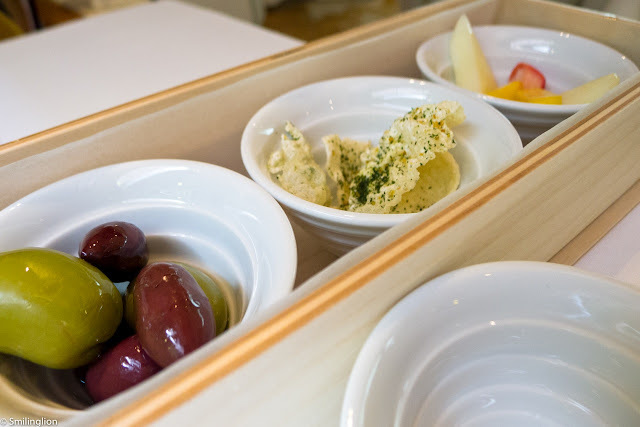 Each of these was very strong tasting, in particular the crackers which were very salty and the citric salad which was very sour. 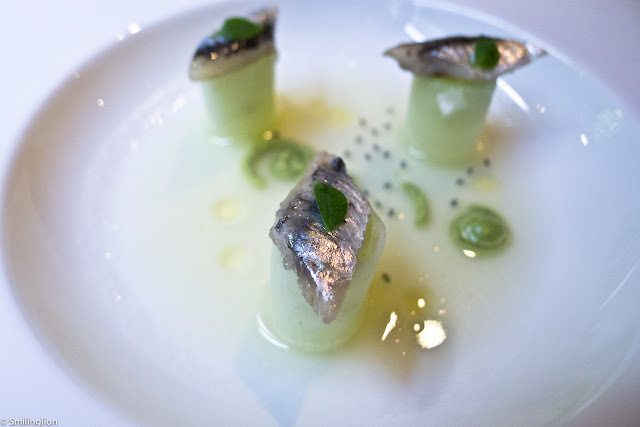 Melon and cucumber soup, marinated anchovy and basil: Unlike the earlier amuse bouche, this dish was a classic example of subtlety. 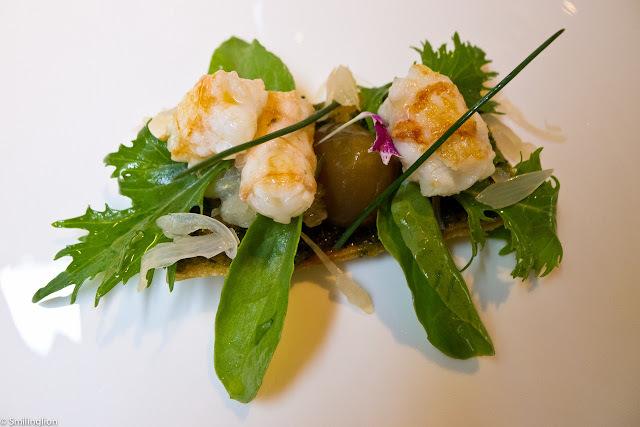 It was a well balanced dish made up of the cold stack of melon and cucumber with the small pieces of savoury anchovy on top of it, and rounded off with the hint of basil flavour. 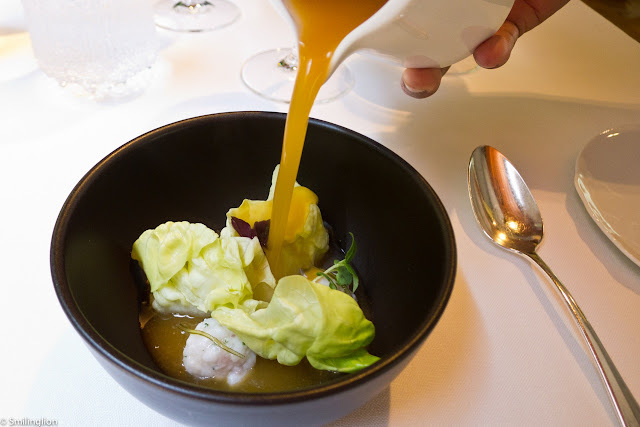 The use of what looked like dragon fruit seeds in the soup was very interesting as they added some sweetness to the dish. 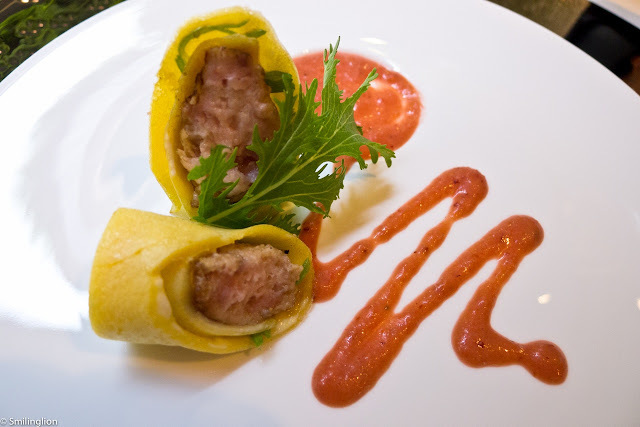 Penedes chicken, omelette skin, snow peas, strawberry and mustard ketchup: This was something resembling a burrito, but with an omelette skin wrap stuffed with minced chicken, and with an interesting sauce of strawberry, tomato and mustard. It was very good. 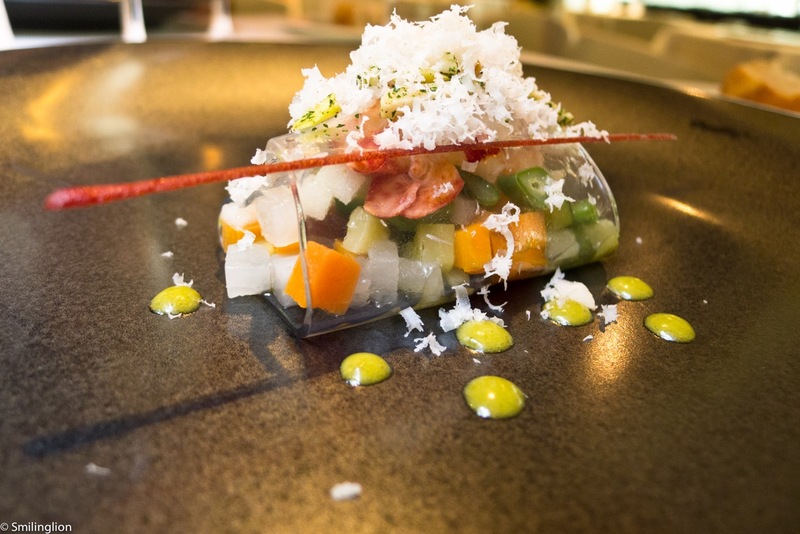 Sea water transparency, with lobster and vegetables: This was a beautiful and delicious creation. 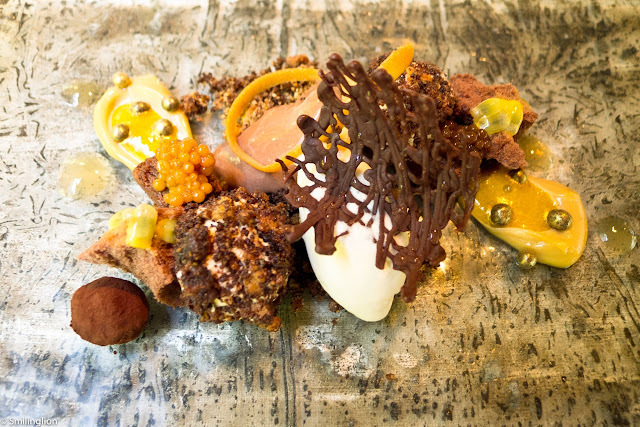 The various ingredients were housed in a gelatinous brine which was reminiscent of the sea, resulting in a multitude of flavours and textures. 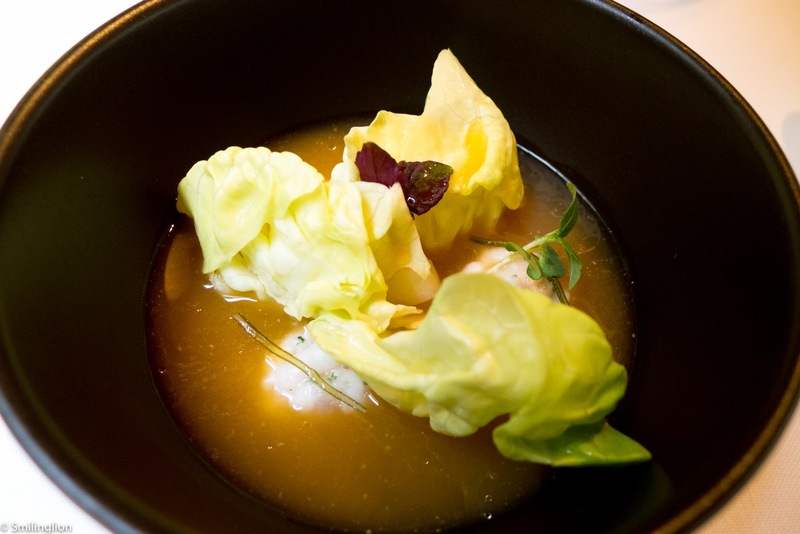 Greater weever, heart of lettuce and dashi of "romesco": An asian-inspired dish, it was like a bowl of fishballs in a miso soup (but with a thicker consistency). This was also excellent. Crayfish, wonton pasta, coral bonbon and "juvert" sauce: The crayfish was quite fantastic and it went very well with the rest of the ingredients. If we were to be picky, the crispy wonton pasta at the base was a tad bit too greasy. Parrot fish, soft curry, fine beans and salmis: This was a Sant Pau classic and one which we remembered well from our meal there. It was every bit as good as we remembered it. The use of curry in this dish was once again quite spectacular. 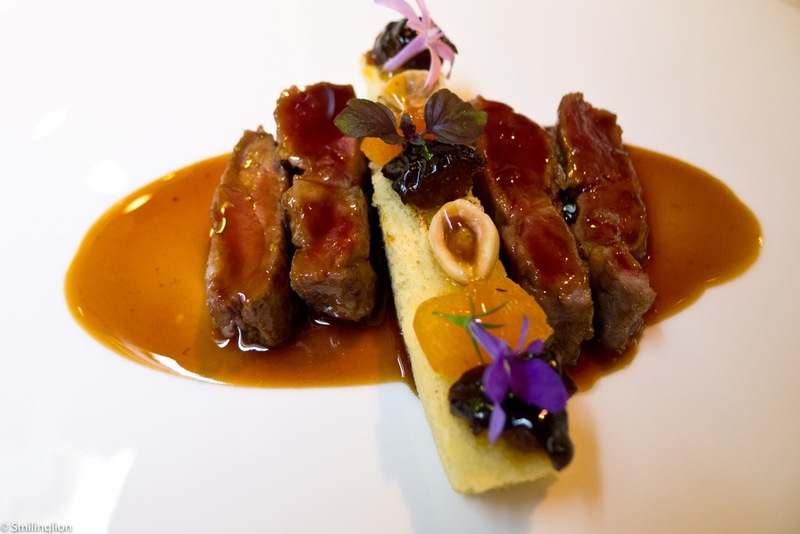 Iberican pork, turnip, dried peach and nuts: And finally, the meat course which did not disappoint. The pork was full of flavour and the sauce was amazing. The use of hazelnuts in this dish (giving it not just the nutty flavour but the crunch as well) was inspired. Pre-dessert - pears and wine: This was a unique pre-dessert which we loved. 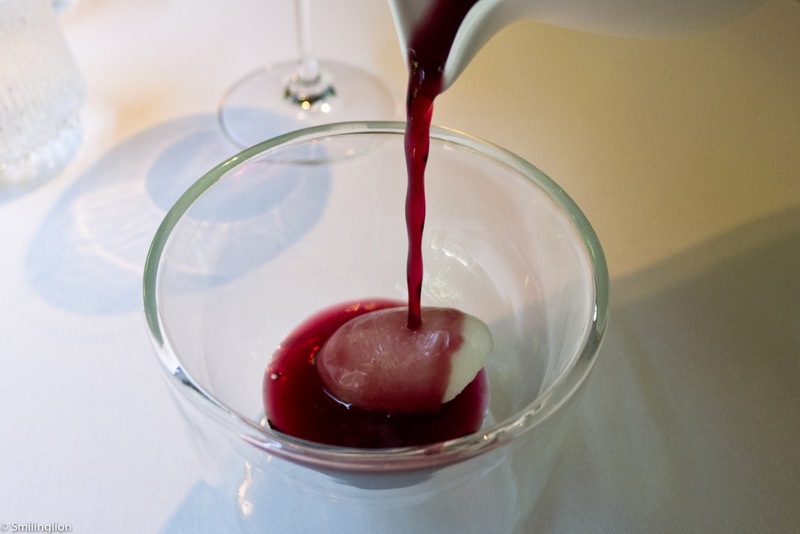 It was cold late harvest red wine doused over pear sorbet. 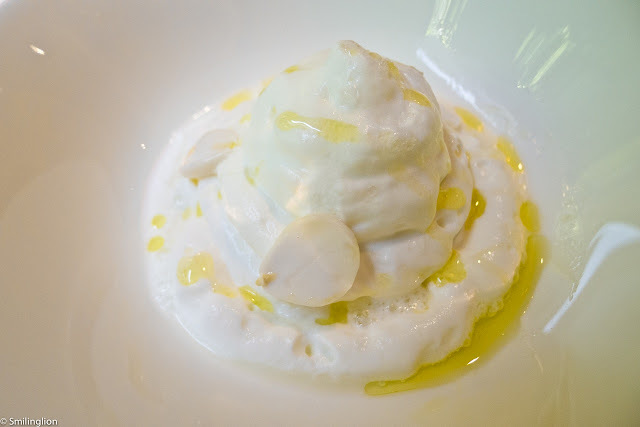 Tender almond kiss - almonds textures and sea water ice cream: Another classic from Sant Pau, this was also a favourite of ours. It was so simple yet so sophisticated. 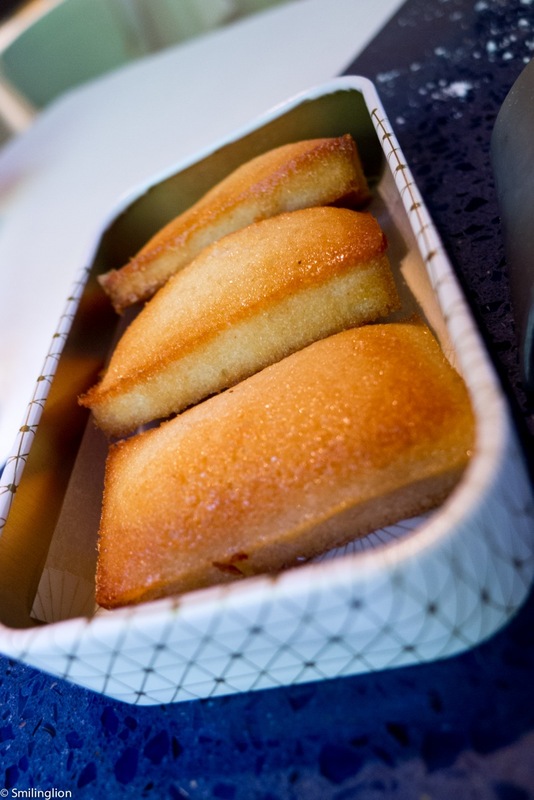 Who would have thought that a slightly salty cream with olive oil and the crunch of almond flakes would be so delicious? 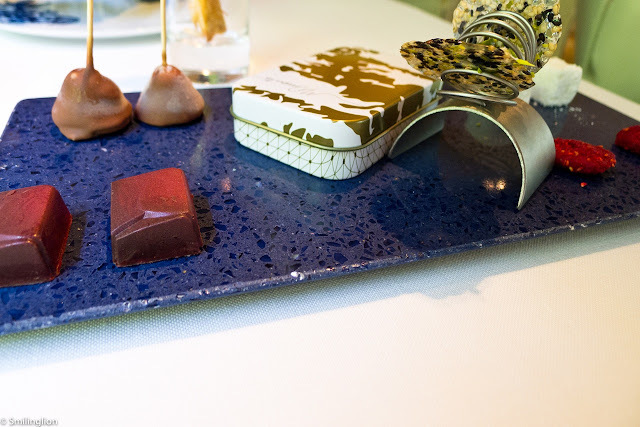 Chocolate - chocolate, coffee and passion: The mishmash of chocolates in all shapes and forms was, despite the mess on the plate, very satisfying. 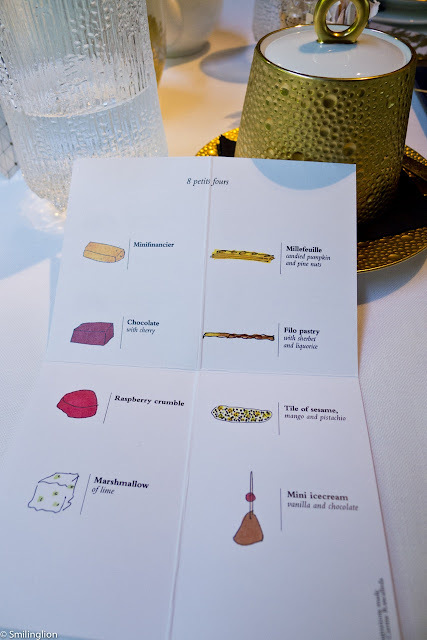 The card they provided earlier which set out the amuse bouche on one side was then opened up to reveal the names and descriptions of the mignardises and petit fours. Millefeuille, candied pumpkin and pine nuts, chocolate with cherry, filo pastry with sherbet and liquorice, raspberry crumble, tile of sesame, mango and pistachio, marshmallow of lime, mini ice-cream with vanilla and chocolate, and mini financier in the tin box: Despite the amount of food which we had consumed, the meal was in fact quite light, which enabled us to still be able to finish the bulk of the sweets and chocolates. Final Thoughts: The food here was excellent and there was a good mix of familiar favourites (the parrot fish and the olive oil cream dessert) and some very innovative dishes (like the sea water jelly lobster). 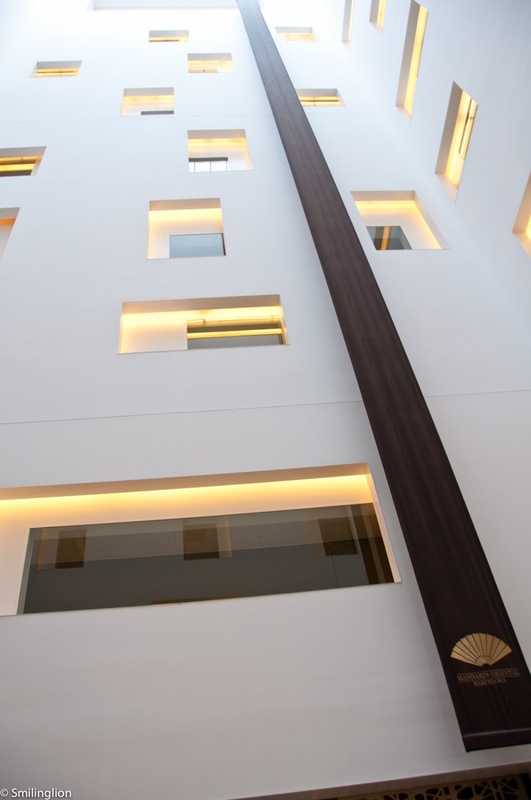 However, we could not help but feel that the ambience was somewhat sterile, given that by mere fact of its location, it generally attracts the corporate expense diners as well as guests staying at the hotel. This was in stark contrast with Sant Pau (which distance from the city discourages those who are less likely to be serious eaters), where the dining experience was, in addition to the food, very much defined by the sea views and the lovely garden at which we finished the meal to the sound of the wind and the waves. 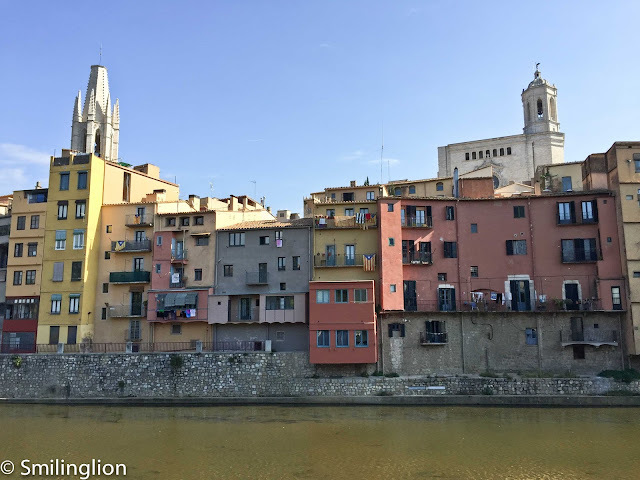 In addition, there was more of a sense of theatre and showmanship in the service and presentation of the meal at Sant Pau which we felt was lacking at Moments.